This lovely vintage fine bone china trio was made by Shelley China of England. I believe the transfer pattern is Hulmes Rose, but I am not 100% sure, as there is another pattern called English Bouquet and I can't really tell them apart. 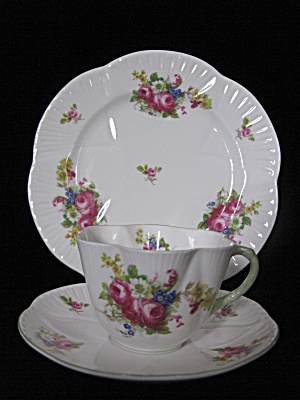 This attractive trio features a cup, saucer and Dessert/Lunch Plate in the dainty shape. The plate measures 8 1/8" wide, the cup is 2 3/8" high and 3 5/8" wide and the saucer is 5 3/4" wide. All three pieces are in excellent condition, no chips, cracks or discolorations.